Large Wheelchair Hobbit House - Maple Leaf Designs Ltd. If you’re looking for a play house that’s ideal for more than a few children at a time, or that is accessible to wheelchair users, our Large Wheelchair Hobbit House is the perfect solution. Much like our standard Hobbit House it is constructed from timber and highly durable plastics to ensure years of enjoyment. The entrance is wide enough for all manual and motorised wheelchairs to access. One internal side has a bench seat for more able pupils and the opposite side is for wheelchair parking. The rear side is fitted with a large clear window for observation fun and the front walls have built-in colourful porthole windows. 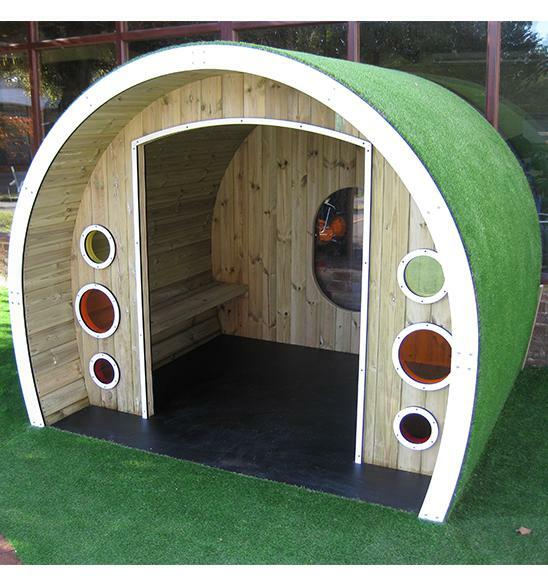 The outside is covered in artificial grass for an interesting tactile finish that children will love.